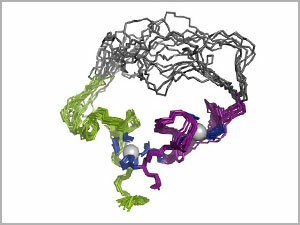 The Human TFIID is a megadalton-sized multiprotein complex composed of TATA-box-binding protein (TBP) and 13 TBP-associated factors (TAFs). Despite its crucial role, the detailed architecture and assembly mechanism of TFIID remain elusive. 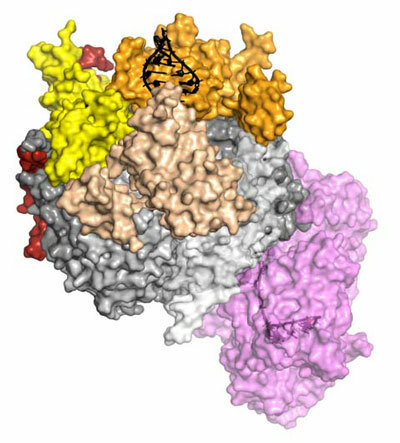 Max Planck Researchers unravel the structure of the machinery for RNA disposal. A research team in Japan exploring the functions of messenger ribonucleic acid (mRNA) - a molecule that encodes the chemical blueprint for protein synthesis - has discovered a way to take a close look at the temperature distribution inside living cells. This discovery may lead to a better understanding of diseases, such as cancer, which generate extraordinary intracellular heat. Scientists at the Walter and Eliza Hall Institute have for the first time visualised the molecular changes in a critical cell death protein that force cells to die. Max Planck researchers crack the olfactory code for partner selection and synthesise the first biologically effective perfume. New technique pinpoints protein locations, helping scientists figure out their functions. Biologists at Tufts University School of Arts and Sciences have discovered a bioelectric signal that can identify cells that are likely to develop into tumors. The researchers also found that they could lower the incidence of cancerous cells by manipulating the electrical charge across cells' membranes. Scientists report that they have developed a method that cuts down the time it takes to make new 'parts' for microscopic biological factories from 2 days to only 6 hours. New method allows plant biologists to 'capture' and sequence the DNA of hundreds of complete chloroplast genomes at 1 time. The evolutionary history of proteins shows that protein folding is an important factor. 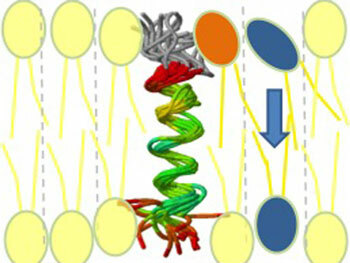 Especially the speed of protein folding plays a key role. 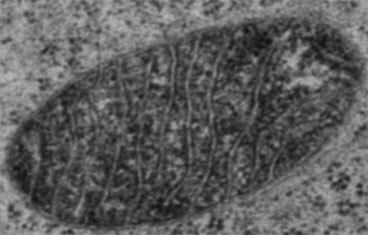 There's a wobbly new biochemical structure in Burckhard Seelig's lab at the University of Minnesota that may resemble what enzymes looked like billions of years ago, when life on earth began to evolve - long before they became ingredients for new and improved products, from detergents to foods and fuels. Biomembranes consist of a mosaic of individual, densely packed lipid molecules. These molecules are formed inside the cells. But how do these building blocks move to the correct part of the membrane? Researchers from Technische Universität München (TUM) have discovered a mechanism to show how this is done. 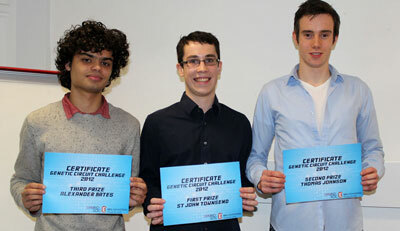 UCL's SynBioSoc announced the winner of their 2012 Genetic Circuit Challenge, an engineering design competition using life science 'ingredients' and sponsored by UCL Engineering. A protein associated with neuron damage in Alzheimer's patients provides a superior scaffold for growing central nervous system cells in the lab. The findings could have clinical implications for producing neural implants and offers new insights on the complex link between the apoE4 apolipoprotein and Alzheimer's disease.